Q. Why can't I print out a T&F ebook in the library? Where can I print out a section of a Taylor & Francis DRM protected E-Book in the Central Library? Some Taylor & Francis ebooks are protected by DRM (Digital Rights Management) and requires that you install a FileOpen Acrobat Reader plug-in to read the DRM protected ebook. To access such ebooks in the library you will need to use special pcs setup for that purpose in the library or install the plugin on your own computer or laptop. At the Central Library, you could use the E-resource PCs near the Reception Desk or the PCs in the Library Training Room (Level 6) to make print outs from a Taylor & Francis DRM protected E-Book. The required plug-in software has been installed in these PCs for viewing the DRM protected Taylor & Francis E-Book. (3) Go to the T&F DRM e-book of your choice, click “Standard access” (not the “Download a copy” or "Quick Access) Note: the downloaded copy cannot be printed. (4) Click on the print icon; specify the pages you wish to print (up to 30 pages per session) from the e-book. (5) Note you will see the following message if you attempt to print the whole e-book. (6) To send the print job to a network printer at Central Library Info Commons, please follow the instructions pasted on the pillar near the PC booking area. (7) If some of you receive an error message when trying to print from the document downloaded via the Standard Access mode. This could be due to the protected mode being enabled in the Adobe Reader. 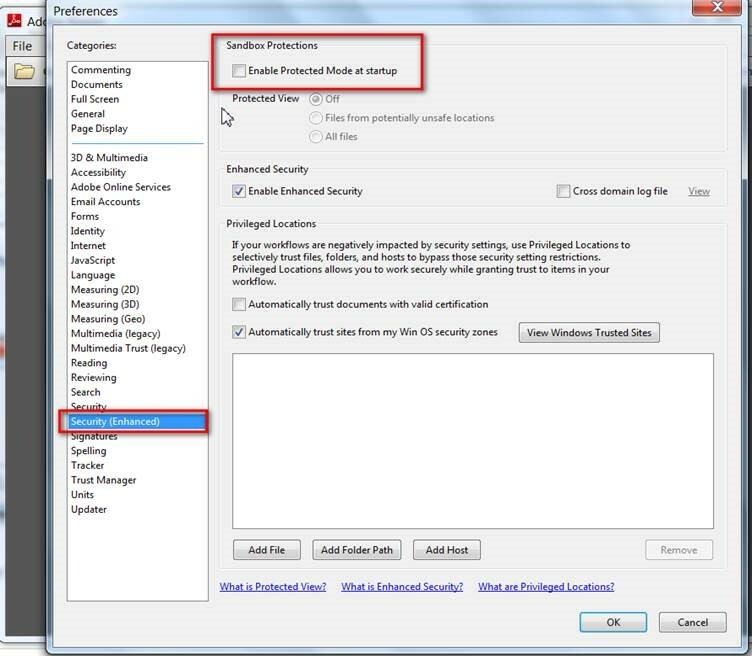 To disable the protected mode, go to Adobe Reader, choose Edit > Preferences and click Security (Enhanced) on the left. Deselect Enable Protected Mode at startup (see screenshot). Also under Preferences > General, uncheck the box for ‘Use only certified plug-ins’ and click OK.